Former PGA European Tour player Robert-Jan Derksen has quit playing golf for some years now. For the ones who knew Robert-Jan Derksen, he was one of the nicest guys on the PGA European Tour. After he quit being Tour Pro he build his own putting academy. So I was struggling with my putting. Especially short puts. How crazy as it may sound I was making more long puts then short puts. So it all comes down to what?... Well I hope to share this article with you and hope you will receive a better look on putting. At arrival we taken a look on my setup, grip & stroke. It was very interested to see that the setup of the club needed some improvements. I was holding my hands to close to my body which cased that the putter sole of the face was not proper on the ground. Meaning I was missing a lot of puts. The most missed puts on tour is from 8ft. I learned from 8 ft you have have about 1 deg. room for missers. When putting a laser on the ball I noticed when aiming center cup. 1 deg. from 8ft is inside right/left. This little margin of room means when stroking or at impact not proper it means more missed puts. We also talked about putter faces. Now comes the interesting part. With the high tech stuff in the academy I measured my YES! i4-tech tour model putter and many multiple Scotty Cameron putters. I noticed on the trackman and Quintic that Scotty doesn't have that soft inserts as what I was expected. The opposite in fact. The Scotty putters are coming off so hard of the face that the forward move of the ball is more then my current YES! putter. You want at impact a square face and right after impact that a short forward movement and then a roll forward. But surprisingly the first 20-30 cm there is no roll on any scotty putters. But when testing the black face putters of Scotty I get a much better and faster roll after impact. So my question... why there is no black face in the New Port putters? If you want to improve your putting the ACADEMY is really great. High tech stuff and you will walk out the door with improved putter skills. Very interesting read Bart. One question I would have is how was your set up different on long putts then short putts if you were making long ones and missing short ones. I do remember seeing Derksen on TV when they were covering the European Tour and if I remember correctly he was a pretty good putter. Thanks for the good read Bart. That is a super looking putting academy. Sounds like a great learning experience! I was also seeking assistance as I seldom make putts longer than 5 or 6'. As a start, I visited a local facility with the SAM equipment. While there was much more information than I am able to understand, some of the simple/basics made a lot of sense (putter face angle at impact being the most important). I felt I gained an understanding of what was happening during my stroke - clubface closing during forward swing - coupled with a slightly closed face just before the backswing (faulty forward press mechanics). Not only that, I was shown some different training aids which might help ingrain changes! Hoping to have more one putters (and thus more birdies!) next spring! Now comes the interesting part. When putting long puts I was focussed on my aiming point/direction of/on the line. Resulting in swing path lane (square) on the line I am aiming for. Resulting in more hole'd puts. On short puts, it seems I've a different routine, smaller stands, different eye position over the ball, and different aim when the putter is steady on the ground. When stroking I was so focused on the hole. So RJD told me this is a common mistake tour players as well. It's important to have 1 routine. There are a number of swings / strokes out there on tour. 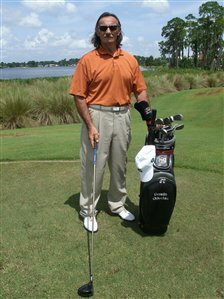 There has been also a lot of famous putting guru's out there but it all comes down to 1 thing: SQUARE clubface at impact. You can have the best putter, swingpath, or coach but if you are not square at impact you miss puts. I've changed my lie angle of the putter in order to help me working in a better stance and 1 routine. Now with a mirror plate and laser I'm practicing my putting. And I must agree with RJD. It's true. I'm making more puts now! Indeed RJD has been out there for many years on tour. His putting was very good. Apart from that he was one of the guys who always walked with a smile on his face. Great guy, shame he is no longer playing on tour anymore. sounds pretty good. One thing I do different. On long putts I focus on the speed , amazing how close I get if it does not go in the hole. Speed is indeed important on long puts. Anything over 8ft I am not focussed on making the put but just put it close to the hole. A great exercise I use to do with my player on tour was standing on 10-12-15-20 ft from the edge of the green. No puts to a cup but towards the edge of the putting green. Then the goal was to stop the bal exactly on the edge. This way you get more feel for the green speed rather then being focussed on making puts. Truts me it really works!